Aerospace Composites Market size was worth over USD 2.5 billion in 2016 and its demand is projected to cross 70.5 kilo tons in 2024. Robust growth of commercial & military aerospace industry will support the aerospace composites market size from 2017 to 2024. The shifting trend toward cost effective alternatives, lightweight & sturdy component requirement and processing efficiency will propel the industry growth. In addition, wide usage in interior and exterior applications will further enhance the overall product penetration. The expansion of commercial and defence sector is expected to witness a strong growth during the forecast time frame. Increasing defence spending is expected to further influence the overall aerospace composites market demand. Technological advancements have resulted in reduced process time, lower cycle time which in turn decreases the overall processing cost. Rising demand for high performance and light weight composites due to the safety concerns and stringent regulations will induce immense potential to the industry size till 2024. The products provides better stability at high temperature and longer durability which in turn positively influence the overall industry demand. High manufacturing cost of composite materials is one of the major factors challenging the aerospace composites market share. Carbon fiber accounted for nearly USD 2 billion in 2016 and is anticipated to exhibit the highest market share of over 70% owing to rising demand from commercial airline operators for their external structural operations. These external operations are the primary and secondary structures of aircraft include wings, fuselage, undercarriage, and propulsion systems. Glass acquired more than 25% of the total aerospace composite market share in 2016. It is widely used in aircrafts for exterior lighting products, lenses, filter glass, and night vision imaging systems. The aerospace application needs glass for sustaining extreme environmental conditions, providing optimum illumination depending upon the climate and reducing overall aircraft maintenance. Thermosetting resins dominated the overall aerospace composites market in 2016 acquiring more than 75% share by volume. The segment is expected to continue its dominance owing to high usage of Epoxy and Phenolics in aircraft internal structures. They provide various benefits such as resistance to corrosives and solvents, fatigue strength, excellent adhesion, resistance to high temperature and heat, and excellent finishing. Owing to these benefits, thermosetting resins are expected to register high gains over the forecast timeline. Superior impact toughness, chemical resistance, and a wide temperature range provide by the resins will support the industry growth. Thermoplastic resin segment was valued at over USD 670 million in 2016 and is estimated to exhibit a significant growth rate over the forecast timeframe owing to higher shelf life as compared to thermosetting resins requiring cold storage for fewer than six months. The provision of the benefits such as less requirement of curing time and easy molding into various shapes will further support the industry growth. Commercial aircraft registered revenue more than USD 1.4 billion in 2016 and is anticipated to dominate the industry over the forecast timeframe. Carbon fiber increasingly used in the commercial aircrafts will further escalate the industry growth. Increasing affordability of flights has increased the number of passengers traveling through flights in past few years. The growth in the overall passengers will influence the aircraft composites demand in commercial aircraft. Growing defence spending will support the growth of the composites in military aircraft. The segment is projected to register 8.5% CAGR for the period 2017 to 2024. Exterior applications accounted for over USD 1.7 billion in 2016. The segment is anticipated to exhibit the highest revenue share owing to the extensive usage of composites in exterior aerospace structural applications. Benefits such as light weight and high strength are responsible for fostering the industry growth over the forecast timeframe. The use of composites enables for 20% weight reduction along with low production time and higher damage tolerance during production. The composites are primarily used to make exterior airframe structures such as fuselage, undercarriage, and wings as they provide high strength and reduce the overall weight of the aircraft. 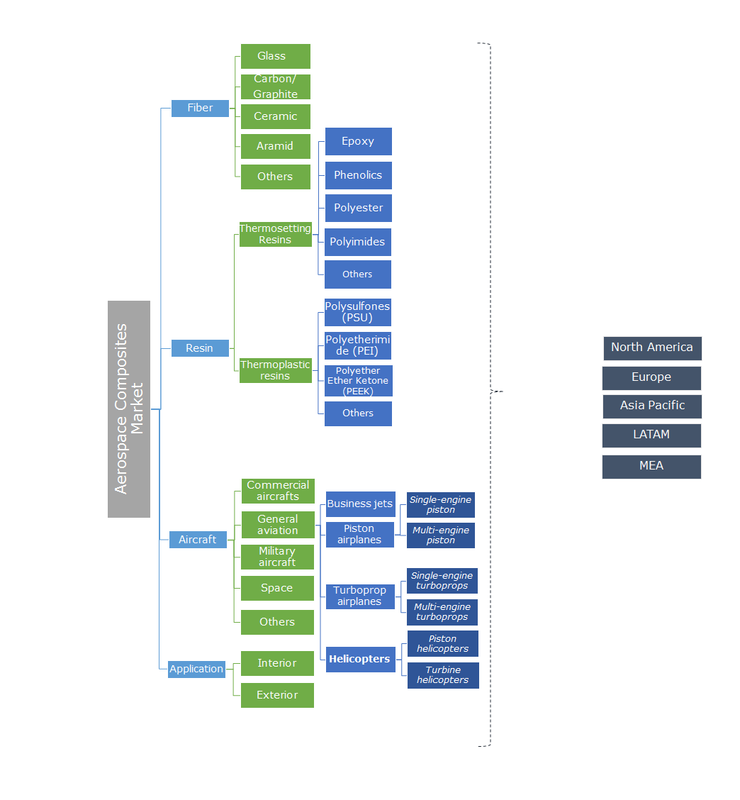 North America aerospace composites market valued over USD 1.17 billion in 2016 and is estimated to exhibit over 7% CAGR over the forecast timeframe. The region is one of the major contributors of overall aircraft accounting over 9,300 aircraft in 2016. 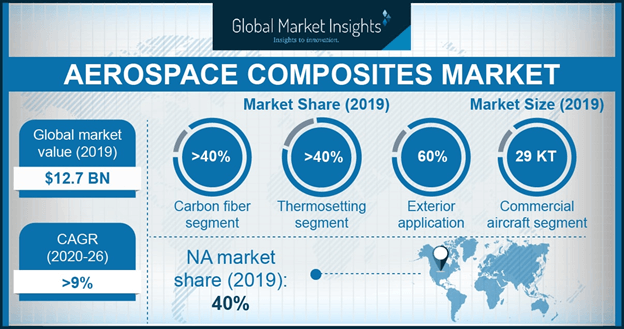 Higher consumer spending along with the higher age of commercial aircraft are among the key factors influencing product penetration for aerospace composites market. Regular innovations for weight reduction coupled with a high demand for fuel efficiency will support the overall product demand. Moreover, vast defence spending in the U.S. will support market growth in North America. Asia Pacific, led by China, India, and Japan is expected to witness steady growth over 8.5% CAGR during the forecast time frame. Increasing demand for commercial aircraft along with increasing number of flights is expected to boost the product demand. The growing population along with better profitability achieved are the major factors influencing the overall market demand. Also, various governments encouraging the private investments in defence and civil aerospace sector for regular technological advancements will stimulate the industry growth across the region. For instance, the military aviation sector in India is expected to invest approximately USD 35 billion over the next 20 years. These quality control and R&D investments can be attributed to the intensive safety and technical requirements. Key aerospace composites manufacturers include Hexcel, E.I. DuPont de Nemours, LMI Aerospace, Solvay Group, and BASF SE. Multiple presence across the value chain to reduce the operational costs is the major strategy adopted. Companies follow forward, backward, or full integration strategies between the raw material manufacturers, composites manufacturers, and distributors. Aerospace market players are mostly forward integrated involving manufacturing and distribution of the product. For instance, Hexcel, Lee Aerospace, and BASF are some of the major forward integrated companies. Regardless of challenges, market players are concentrated on improving their net worth. Manufacturers focus on increasing export to strengthen their geographical presence. In addition, the companies are augmenting the production capacity to cater to increasing demand worldwide. Due to these factors, the industry rivalry is expected to be high over the forecast period. Aerospace composites market is the largest and the most critical to the composites business. Commercial aircraft, helicopters, military craft, business jets, spacecraft and general aviation aircraft make generous utilization of composites inside and outside. With advancements in composites, the aviation industry has switched to composite compounds of carbon filaments, polymers, and metal frameworks. Carbon composites have been successful in giving quality to structures and the aerospace industry. The composites are supplanting ordinary aluminium alloys and steel structures with lighter, more grounded, and strong materials. The composites last longer as far as operational hours and are difficult to settle. In addition, the materials don't experience the ill effects of rusting, reducing the efforts for support, and cost. Composites have a brilliant resistance to heat and can withstand high temperatures and outrageous powers experienced via aircraft ailerons, flaps and fuselages. The use of aerospace composites is becoming important in the interior and exterior structure of aircraft owing to their superior performance, high strength and compliance with the stringent environmental norms requiring the use of lightweight and fuel-efficient composite materials.